Cat Company is not the name of some feline business. It's the phrase I use to describe the physical presence of one or more cat companions joining in my gardening activity. 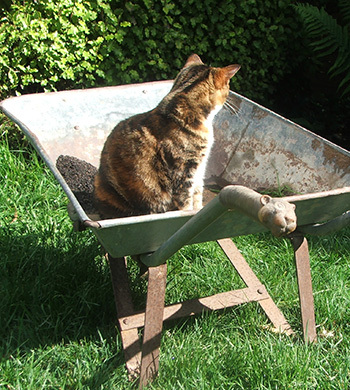 Cats are expected to look interested at all times, even when it's drizzling or raining, and to interact with the gardener - for example by sitting underneath, or indeed in, the wheelbarrow. Cat Company also involves entertainment. Climbing trees, or leaping into planting holes are great for relieving the gardener's boredom. And striking elegant, whimsical poses in the garden is great for the gardener's photograph albums. Peeping out from a plant or flower, sitting in greenery, stretching out on mulch, walking on garden paths, balancing delicately on fence posts - these all have all great visual value! Some gardeners (me) talk a lot, so every now and then a catty squeak or a chirpy miaow in reply goes down well. After all, good conversation is a two-way thing! 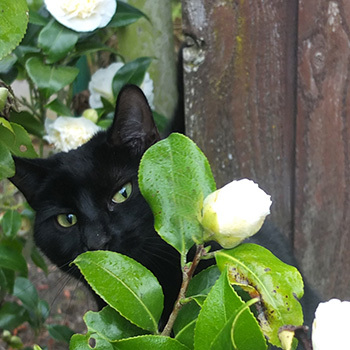 Some cats like to sneak up on the gardener, or hide in the shrubs to give him/her a catty surprise. Others will choose to announce their arrival with noisy purring and smooching. Either approach is acceptable. For the safety of all it's best not to interfere with the gardener's hands. And definitely no claws! Hand weeding is not a game. 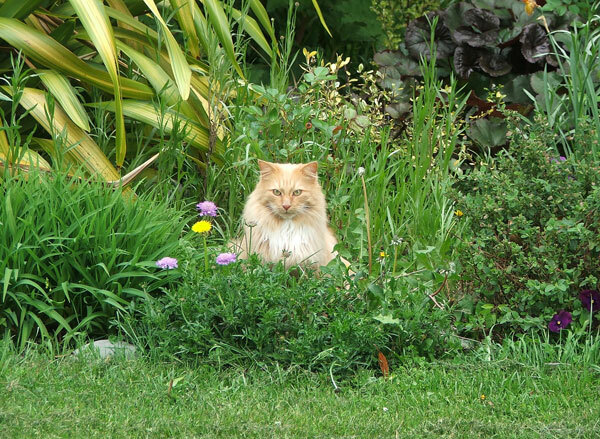 Good quality Cat Company always follows the gardener if she shifts her gardening base, though wise cats will establish themselves by the Cricket Radio (refer to appropriate page) on a summer's gardening day - if the cricket is on. Or the gardening Ipod with the obligatory Rachmaninov piano concerti (weeding music) blasting out. They know that this goes on for ever, and the gardener will definitely be returning. Occasionally cats have been known to remain firmly in place, getting drenched in a rainstorm, rather than move to shelter. At such times one hopes that their gardener will eventually remember to call them inside! Oops. 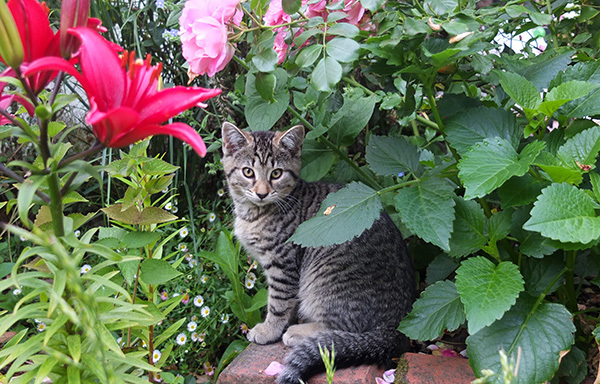 Cat company is strictly voluntary, but kittens are trained from their earliest days to be in the garden. The little ones may be called and carried. But adult cats are just expected to turn up to the gardening spot. Laziness will not be tolerated. 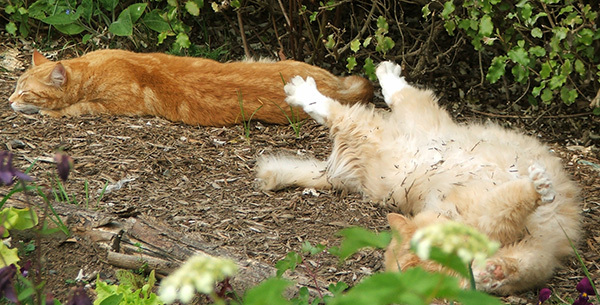 Older cats can, of course, be tempted with dried cat food in the gardener's pockets. 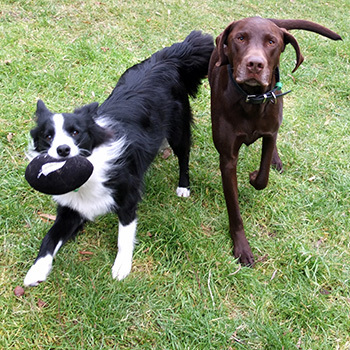 The Moosey dogs have always been encouraged to provide quality gardening company. But dogs are less responsible than cats, and certain canines have been tempted to wander off and follow their nose, chase a duck, munch some hazelnuts, find something disgraceful to roll in, and so on. Dog Company can be stressful, involving too much vigilance. Some dogs lack the concentration required and just wander off on a whim. Others, like the newest, youngest dog, Winnie, have a single-minded, self-centred concept of companionship : the throwing of her ball. Woof? Is that you, Winnie? What do you mean, throw the ball? Again?